We will give you more than 100 proxy servers list today. We usually have a huge problem with the sites which are blocked from our workplace or college. And in some MNC companies they will block some sites which we cant access from our system anymore. so what to do at that time? we usually wont have any other choice. But this problem can be resolved by using proxy servers. So what is a proxy server? A proxy server is usually a 3rd party servers which act like a postman. It acts as a mediator between the user (browser) and the Internet (server). Proxy will bypass the ISP’s IP which we are using now and allow us to browse with a different IP address. With proxy we are just like a anonymous user who wont have any name and location. We are untraceable with the proxy servers when we use them.We can easily bypass any parental and security locks to use. I mostly use this servers to protect myself from hackers and also to send a fake email’s. I have collected over 100 proxy server links so that you can save them and use whenever you require them. All we have to do is to go the server link which is provided below and just enter the website name which you want to enter and then browse it as you would browse a normal site. 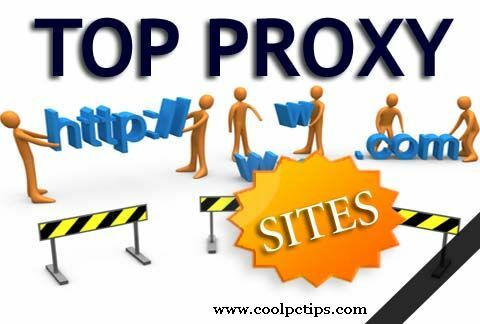 All the websites are permitted to show the same data which were relevant when you are not using the proxy.and If you find that you are blocked from your favorite websites, use one of these web proxy sites to get around the block. I will list out the servers below.so make the best of it. All these servers are risk free and may be some of them wont work because of overload and some servers might be shut down for a while.All most all there 110 proxy server sites will work. If you have any query please make a comment here.Share this proxy servers list with your friends if you have a blocked internet services. Stolen Passwords From Popular Websites Leaked – Here’s How to Be Safe! There are still a lot more servers which are not upto this servers list. please let me know if i have missed any important proxy server link. Got here from google and most of these sites are blocked sadly. Also VPN from hidemyass is also good. Please make a new article with lots of new proxy site. FortiGuard web filtering its block gmail,facebook ect. I tried all proxy server but not use .